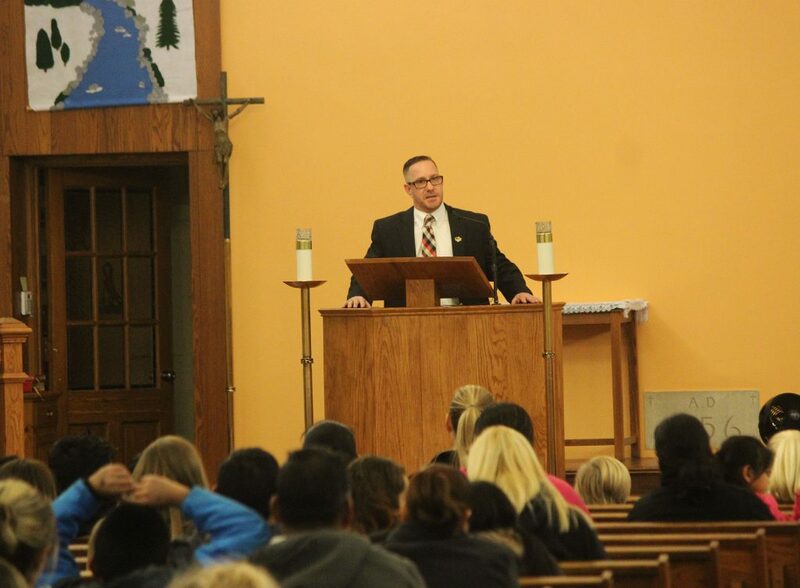 Every pew at Saint Joseph’s Church in Somers Point was packed on Monday, Feb. 6. Parents and their children were all there for one reason: to honor the military through spiritual and corporal works of mercy. Father Ed Namiotka, pastor, opened the event by explaining the difference between the two traditional Catholic actions, keeping even the most fidgety children engaged as he gave examples of each. Laurel Marchesini, director of Lifelong Faith Formation at Saint Joseph Parish, took the microphone. “Today,” she said, “we will be honoring our veterans in two ways,” she explained. “First, we will say a prayer for them. What kind of mercy would that be?” she addressed the audience. None of the children bothered raising their hands this time as they all shouted out “Corporal!” in unison. Among the attendees was guest speaker, Mark Taylor, director of Veterans’ Services at Catholic Charities, Diocese of Camden, who spent 12 years in the Army. A round of applause erupted as Marchesini introduced him and called him to the pulpit. This motivation, he explained, extends to his work at Catholic Charities. Many families approached Taylor after his speech, asking where they can drop off donations and how they can become more involved with Catholic Charities. Several mentioned that they’ve been saving donations for the agency’s “Stand Down” event in May in Atlantic City, which will link vets to a broad array of free services and benefits, such as VA benefits, medical, mental health and addiction services, welfare benefits, legal services, housing, haircuts and clothing provisions. 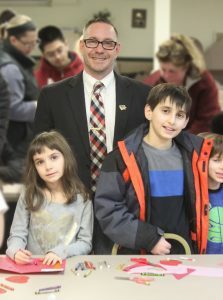 After Taylor’s speech, crowds poured down into the church basement, which was set up with tables, prayer cards, markers, stickers, and paper – all for the families to create cards for military personnel overseas. 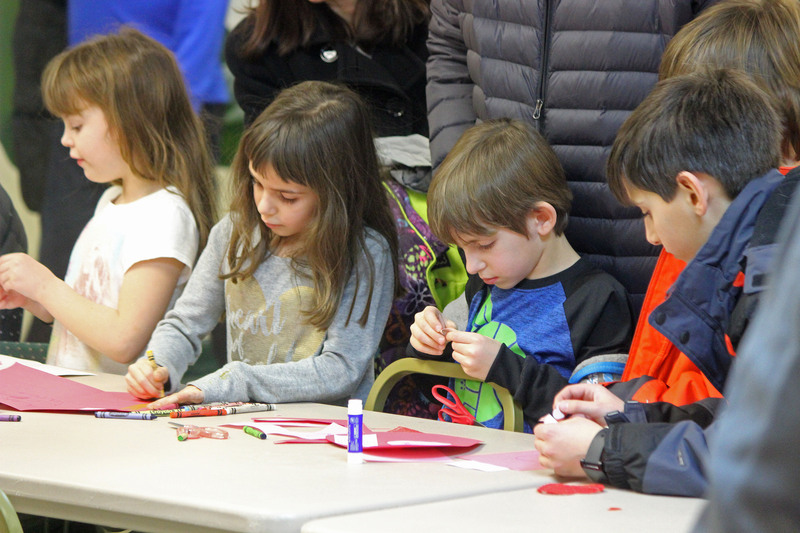 The families got to work immediately, fastidiously creating Valentine’s Day cards. Many of the attending families have family and friends who are currently serving overseas. Click here to learn more about Veteran’s Services.